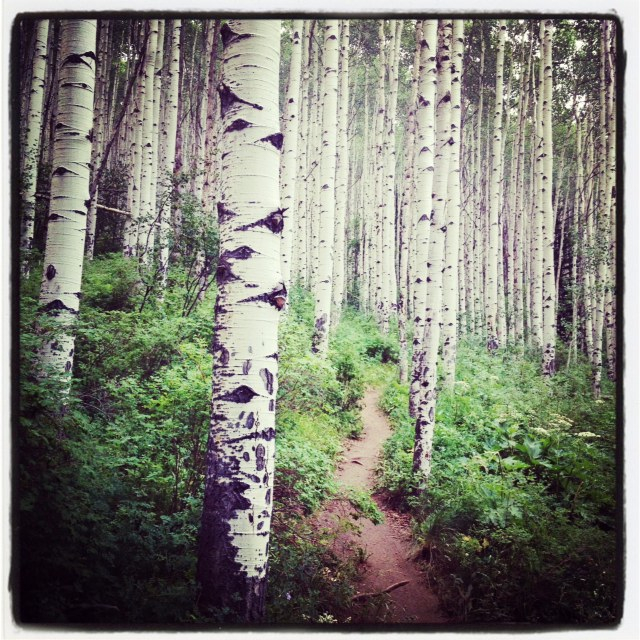 XTERRA run course- Beaver Creek, (near Vail) Colorado. I pre rode the bike and run courses 2 weeks before the race and snapped these pix I’d like to frame one day when we have a home. 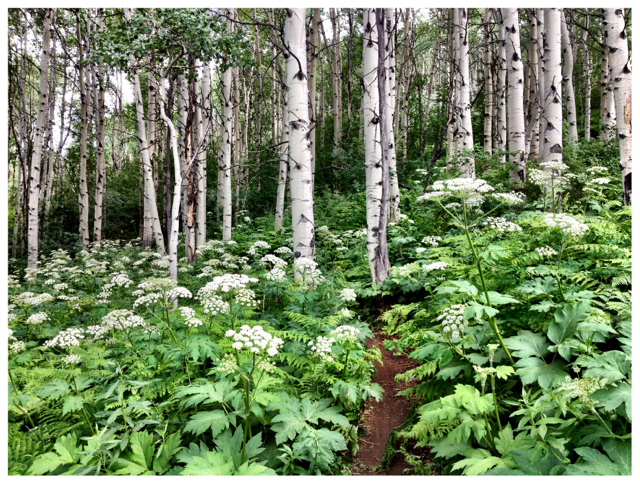 I havent blogged about it yet, but last weekend I raced Boulder Peak 5150, 6 days before my 1st Beaver Creek XTERRA Mountain Champs. I raced 4 or 5 pain & adrenaline filled XTERRAs on the dazzling (in many ways) ski slopes of Keystone ski resort- between 9000-12000 ft alt -the kind of place where Ned Overend roams free. 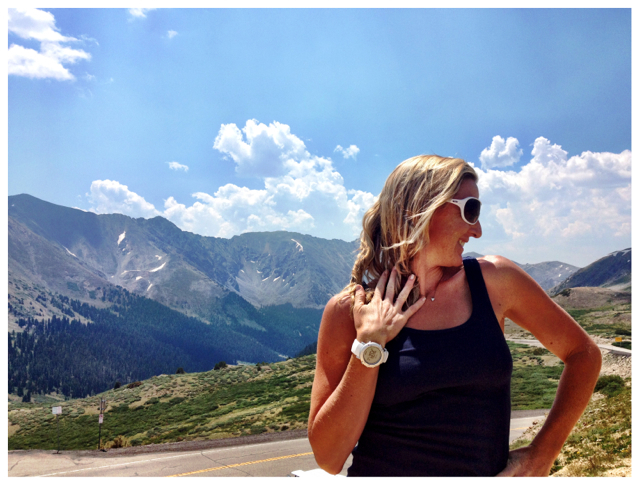 On the drive up from Boulder, Liezel (jokingly) modeled her new Suunto Core Alu Pure White and Oakley Immerse sunnies on top of Loveland pass CO.
With only 6 days between races, recovery training is obviously the order of the day. 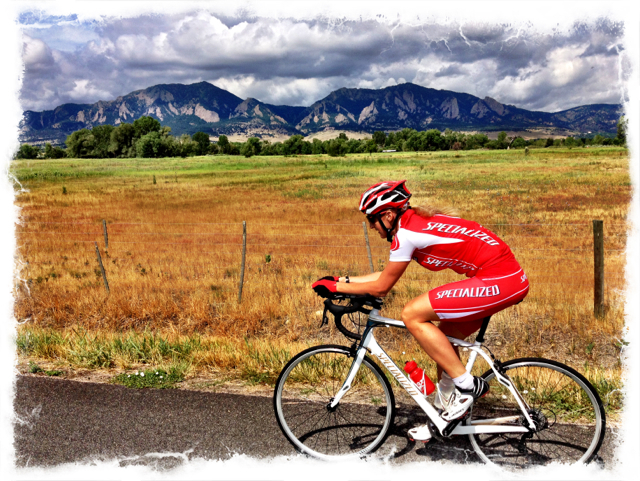 Did a fair bit of scenic Boulder riding with Liezel on her new Ruby. Our friend and Specialized mechanic Dylan joined us for a coffee shop ride to the town of Hygiene. No pun intended. 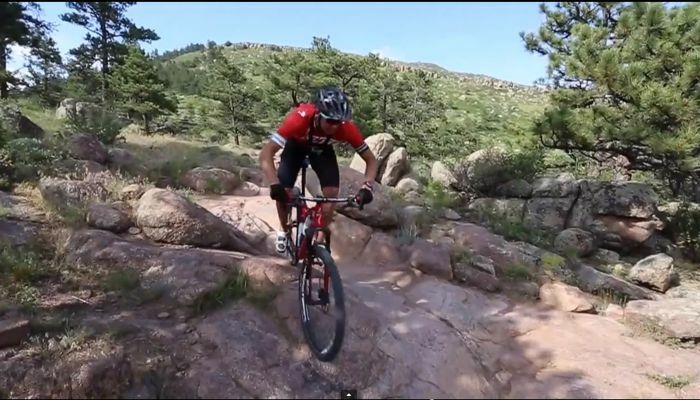 Husband and wife training camp – Flatirons CO.
Josiah is a fearsome competitor as it is. 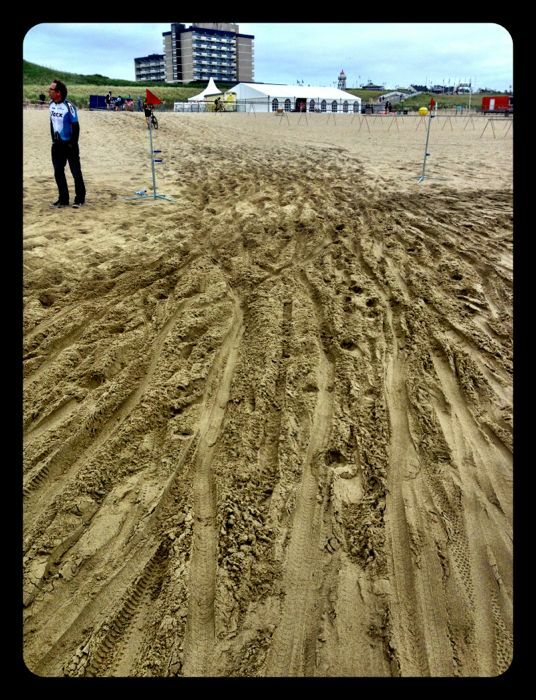 But this course is just 2mi from his house- meaning he’s used to breathing fake “air” and more importantly, he knows how to go uphill fast! Oh, and just seeing his “Josiah Face” during a race is enough to trigger the “Fight or flight” response! Who knew tires could shine that bright? I think the product is called “Sonfagun”. Seriously. – Watch the local Rodeo. 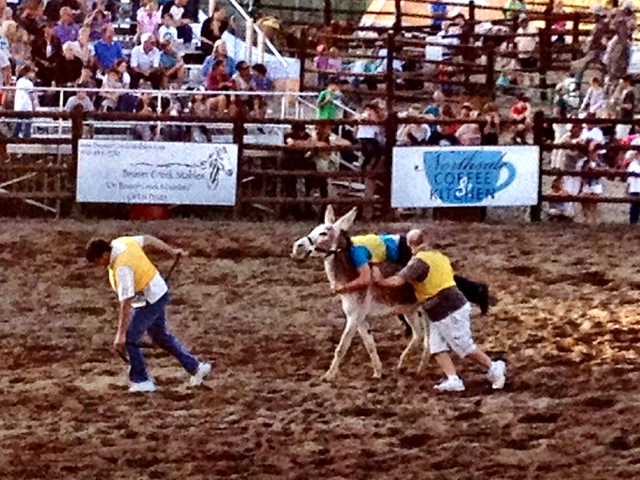 The 3 man Burro barrel race was almost as spectacular as the bull riding. 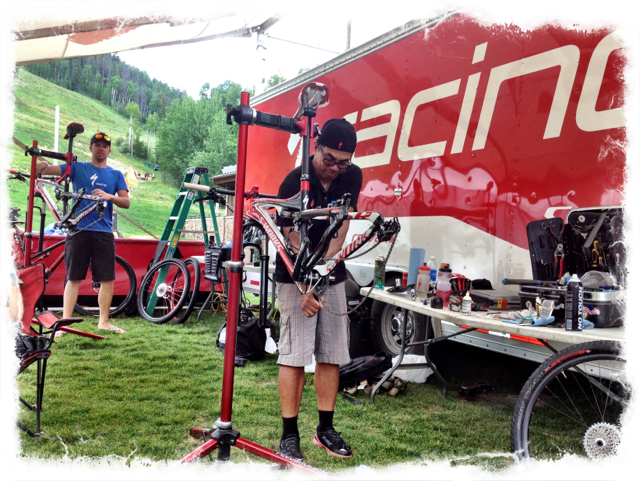 For Specialized Racing mechanics Dylan (Boss) van der Merwe and Joe (Spider Monkey) Devera “getting the bikes ready” is not what triathletes are used to. 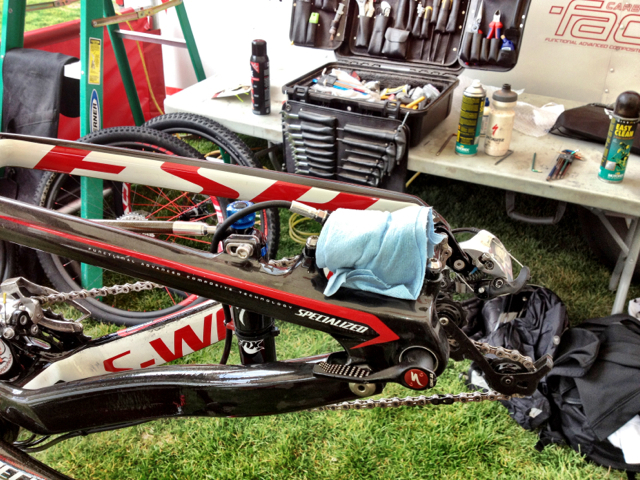 Its not a quick wipe with the hotel towel, chain lube and tire pump. 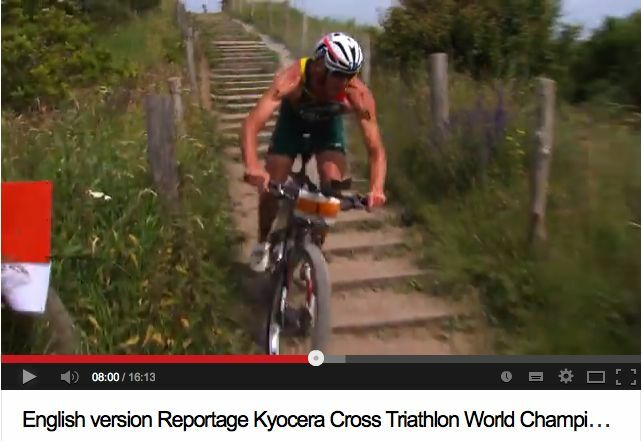 These guys come with a Mountain bike World Cup approach. 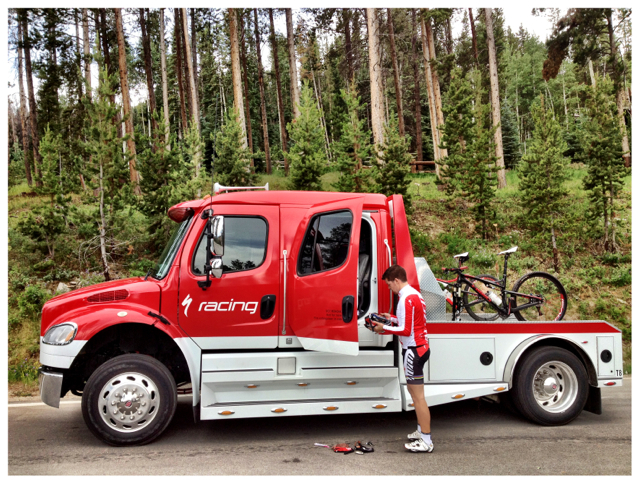 Full Team truck- Full Monty. Every bike gets stripped and rebuilt- fresh parts where needed, fresh tires, fresh cables, fresh grease, fresh Lock-tite, fresh alles. For the massive amount of climbing I switched to lighter grips, lighter tires, no Command Post, but after weighing pedals and shoes decided to not go with the road shoe /pedal combo. 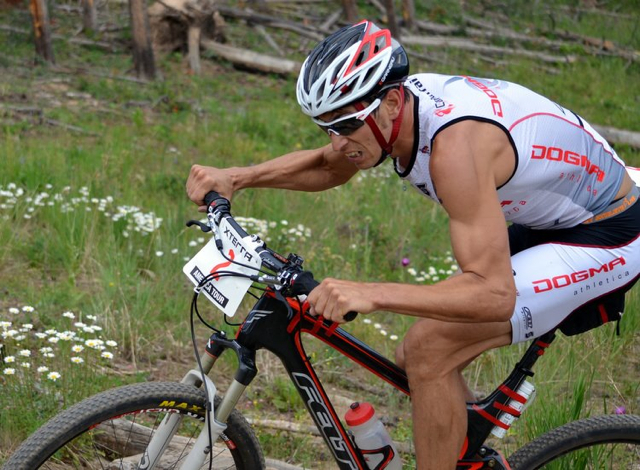 Dylan van der Merwe in blue (Stellenbosch, South Africa) works with Specialized triathletes and Mountain bikers at events around the globe and is going to the London Olympics to support our athletes. 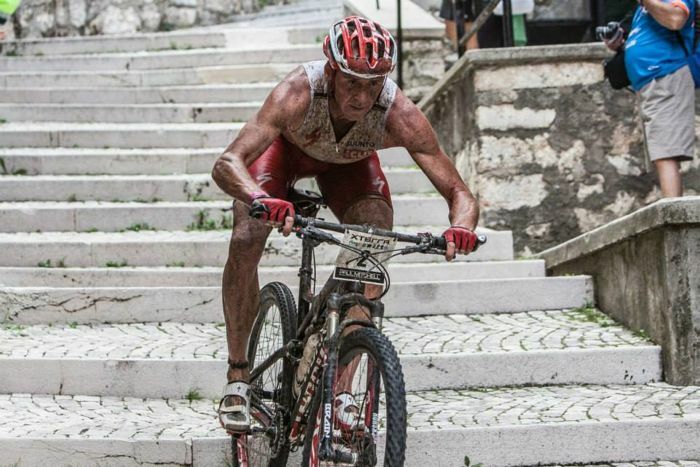 To top it off and used to be quite the triathlete- on and off road. 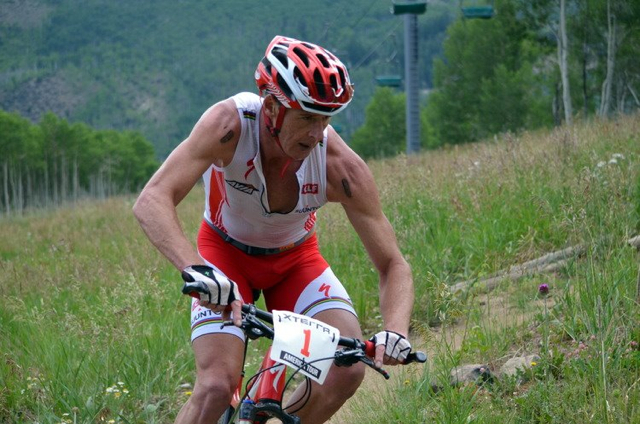 Joe Devera “Spider Monkey” used to be a full time sponsored rock climber (often living in a VW van), worked on various road cycling teams, including the Mavic Neutral Support Team before wrenching on Specialized MTB and Triathlon teams. 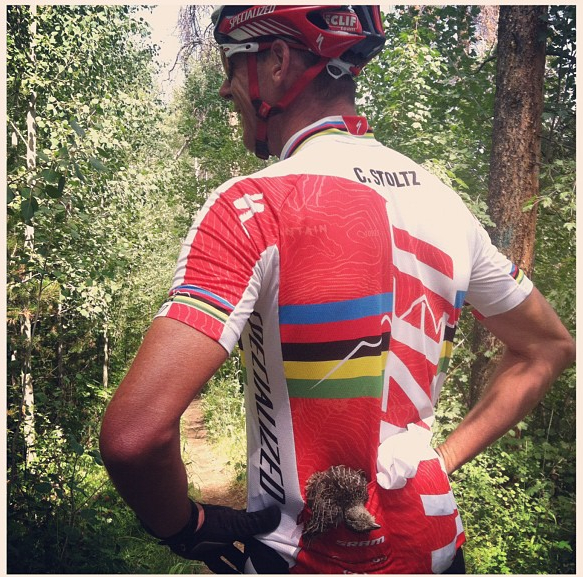 Spend some time on iamspecialized.com and see why Specialized Racing is the best racing team across all disciplines. But if your hotel has no garden hose, a good bike wash starts in the shower. Dylan washed 3 bikes as part of his pre race prep. Here is my version in Spain 2011: Bike Shower. 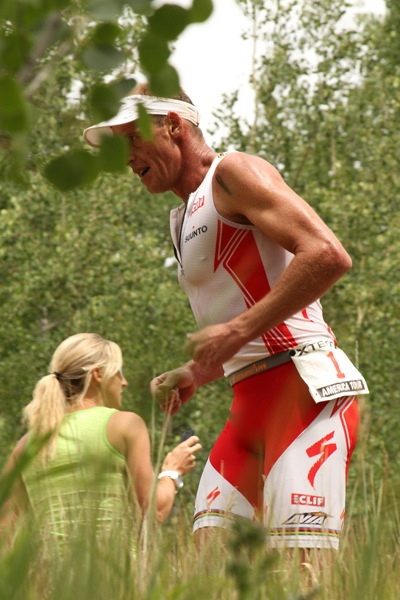 After getting pounded in the swim by 2,40 at Boulder Peak, we unleashed “DefCon 4” swim training, ok, in 6 days I only had time for 1 DefCon 4 session- but half the speed is attitude anyway – by XTERRA time I was good to go. 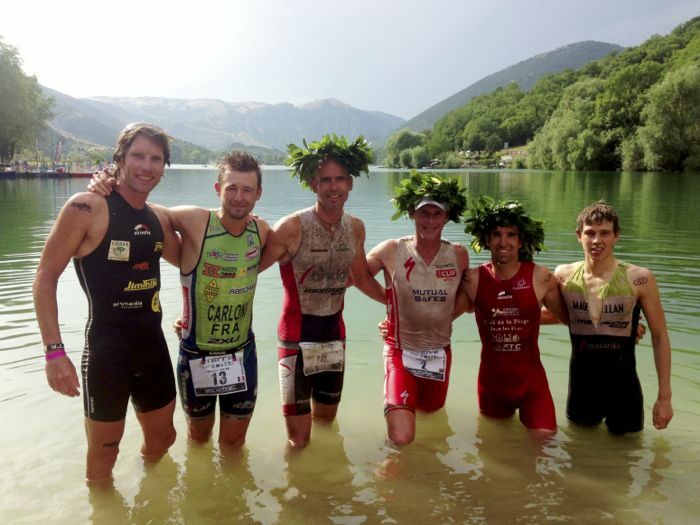 Swam with the leaders no problem. Craig Evans, Branden Rakita & Ben Hoffman. The new Blue Seventy Helix wetsuit and Vision goggles helped get the job done. 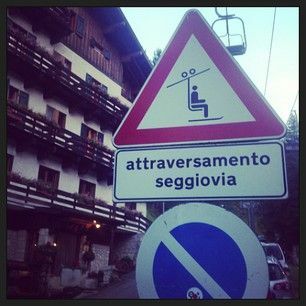 Note the looming ski slopes in the back ground. Intimidating stuff. Did I say the bike climbed A LOT?! 3200ft straight up. (about 1000m of alt gain in 35min) Starting at 8100ft. 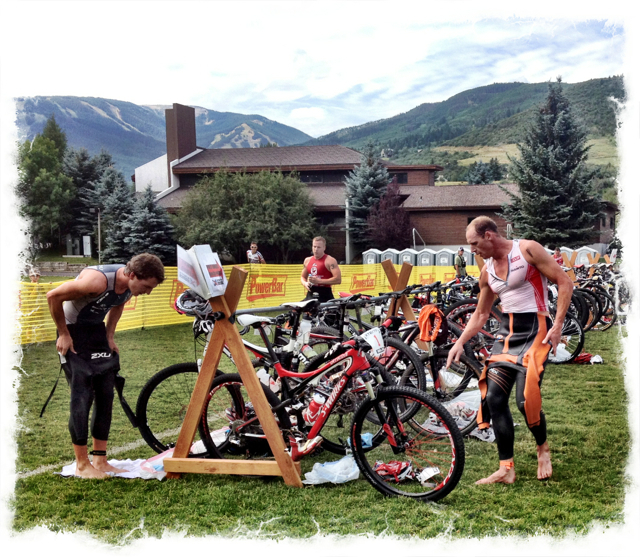 Not 1 second of free wheeling (or even soft pedaling) in the 1st 35min. So pacing is crucial. The recent road tris helped me get used to the sustained effort (also called “pain”) of the TT effort- as opposed to the hit and run efforts on the “normal” MTB ride. At least the course is really really scenic. That is if you can see past the black spots and flashing lights. Took this pic during pre riding when I could see and think and breathe all at the same time. My dietician and chef (Liezel) has been mixing the “Power mix” a bit leaner the past few weeks- fewer M&Ms in the trail mix. The season of Flatland Racing is over and Climbing Season is officially open. 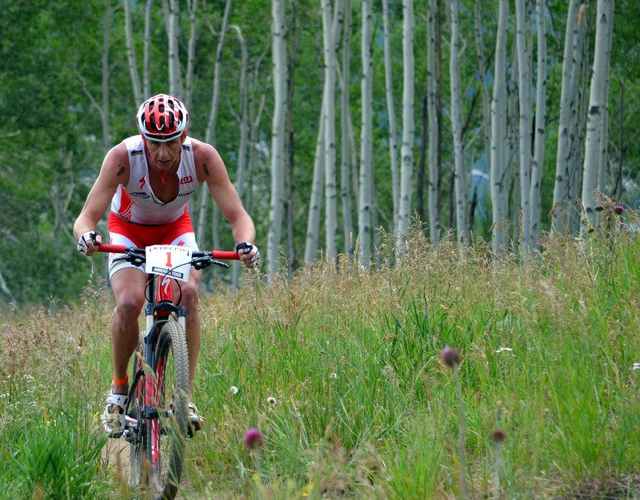 (XTERRA Utah and Maui also climbs a lot) So power to weight is crucial. 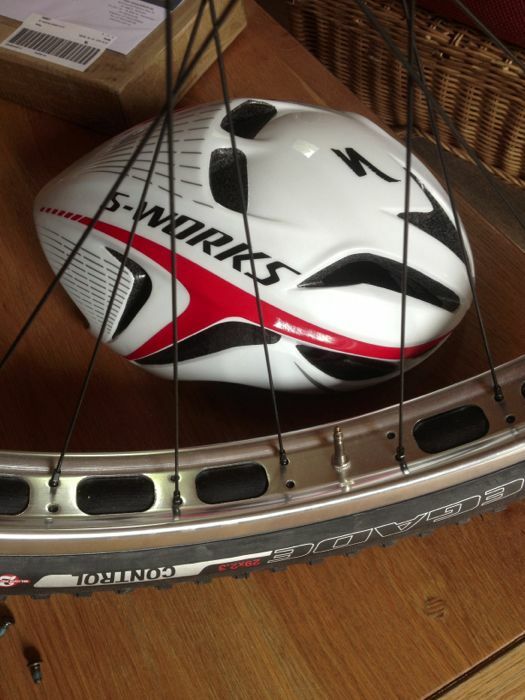 No point trying to take the weight off the bike – its light enough already- its gotta come off my backside. 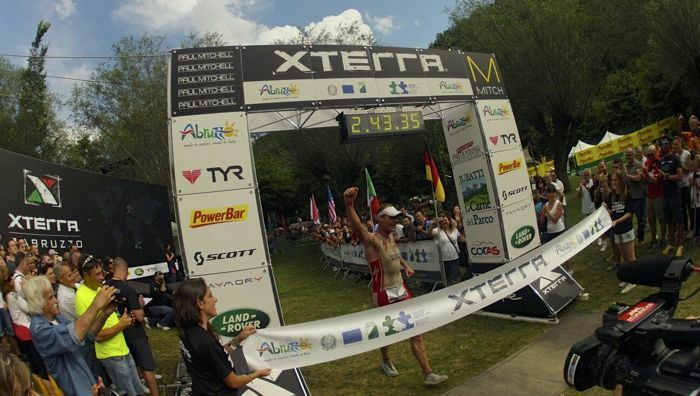 Since the Luckstone XTERRA in Richmond, athlete tracking by GPS has been all the rage. You can see the GPS unit on my number belt. It doesnt swim yet, but people can track all the athletes live online. Pretty cool with todays’ social media & technology making the world a global village. Judging by my “Josiah Face”, you can see the run was really really tough- basically 2.5km vertically up – so steep, I walked 4 times- and 2.5km straight down. Twice. Looks like I’m “parking a tiger” (throwing up) in the bushes- felt like it- but I was power walking up one of the steeper hills. I find walking the really steep parts is almost as fast as running, but your heart rate stays lower, so when I get to a flatter section I can run at a good pace right away. Liezel looking down the trail to give splits- after the bike I had a 2;30 gap on Josiah, lost 50″ on the 1st climb, but then held the gap over the last 5km- winning by 1.20. For one day Colorado’s second language was Afrikaans. The mountain was crawling with South Africans: Other than Liezel & Dylan (pictured) finished 3rd in the Sport race there was also a very vocal Melt Swanepoel (racing the US Marathon MTB series) Dewet Marais (from Squirt lube), Brad Weiss (DNF – says the altitude bowled him LBW) the guys from GU South Africa vacationing, and few families spectating. 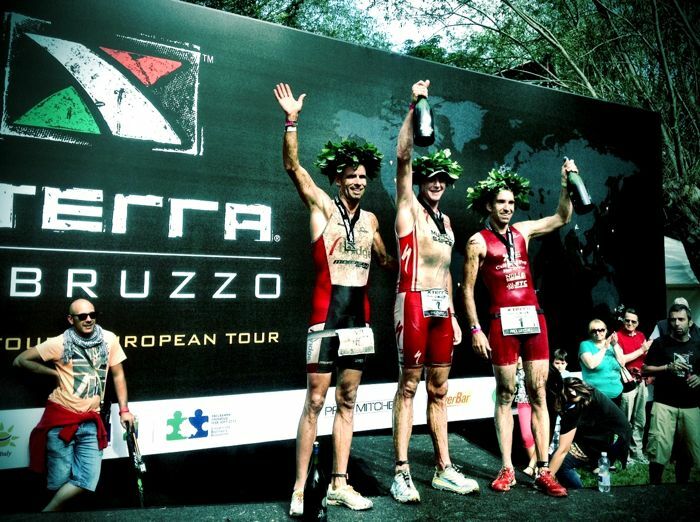 6th XTERRA win this summer. [For Stoltz, not altitude, not abear, not even Josiah Middaugh – a mountain master on his home course – could disrupt his perfect 2012 season. 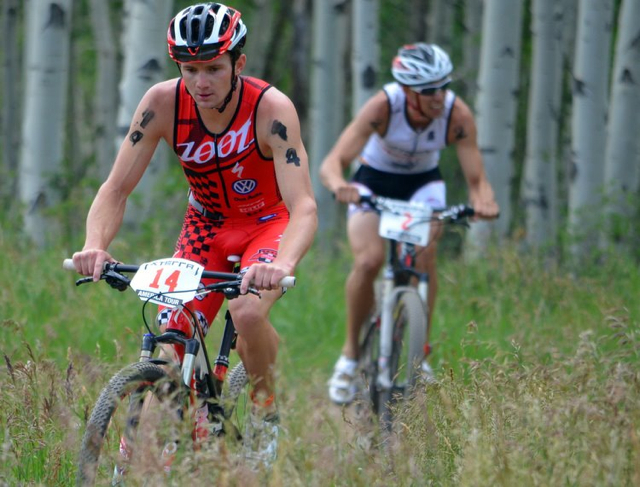 Stoltz started the year with a win at the XTERRA South Africa Championship, then swept through the XTERRA regional championships in Nevada, Alabama, Virginia, & now Colorado to bring his unprecedented XTERRA all-time championship wins total to 47. Stoltz came out of the mile-swim in the 66-degree waters of Nottingham Lake on the heels of leader Craig Evans and Branden Rakita, with Ben Hoffman directly behind him and David Henestrosa and Middaugh a minute back. By the three-mile mark, and after the first of nearly four-thousand feet of climbing from the lake which sits at 7,400-feet, Stoltz led by a minute with Hoffman and Middaugh chasing together. 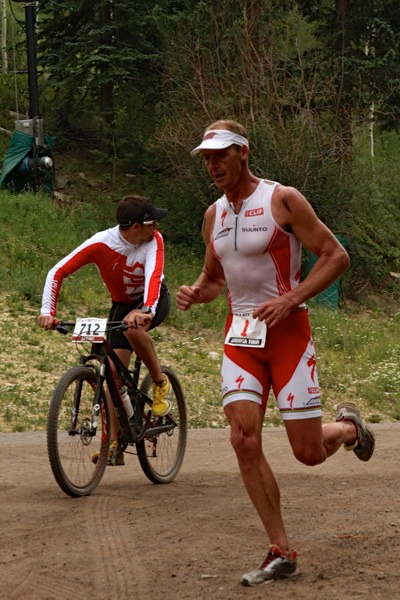 At mile 10, Middaugh moved into second but hadn’t closed the gap and by the bike-to-run transition Stoltz, who had the fastest bike split of the day in 1:09:46, had more than a two-minute lead. 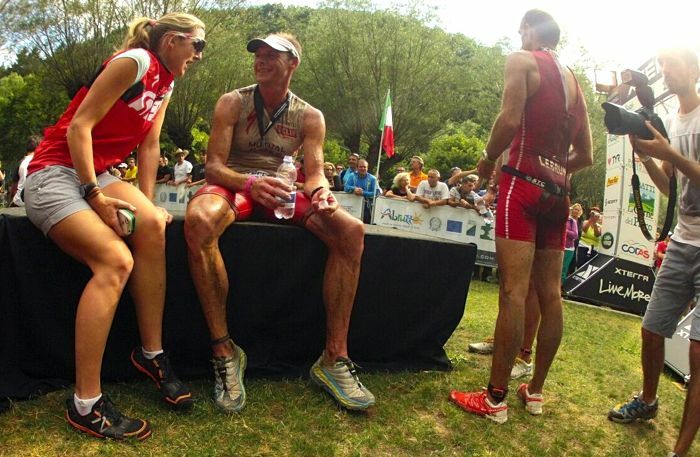 Ben Hoffman had an incredible race in his first major XTERRA, and by the looks of his post-race grin it seems certain not to be his last. 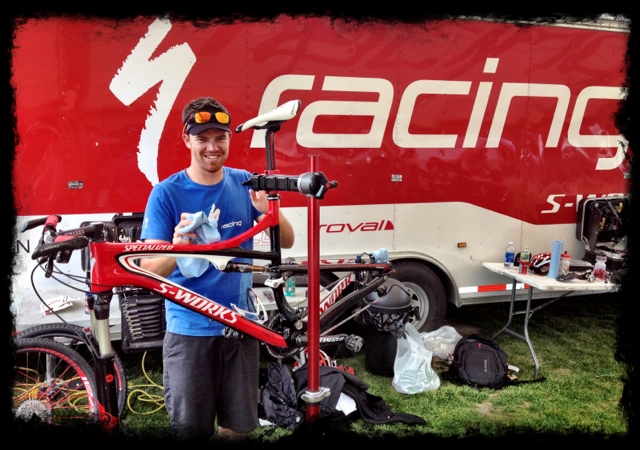 After his 3rd place in the Sport race Dylan slammed a gallon of Chocolate milk and was back on the job cleaning bikes. I learnt another wrenching trick- when washing the bike with degreaser, cover the brake pads with paper towel to avoid fowling the brake pads. Pre ride some the best parts of the 2012 XTERRA Grabouw bike course with the Caveman.